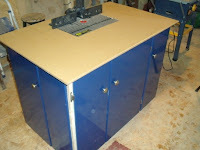 Welcome to my Blog on wood crafts, diy projects, carpentry and more. 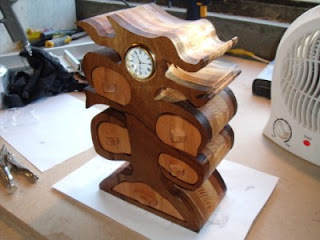 Crafts include - wooden clocks, business card holders, nameplates, furniture, bookcase's, cd case's, artwork and lots more all from my workshop in wexford - Ireland. I have not been posting in ages but i have been working on a project which has taken me four months of hard work, god when i set out to do this i did not think i would be t his long at at. But i have to say it was well worth the work and by the response i have gotten from my family and friends i am amazed. Thank you all. 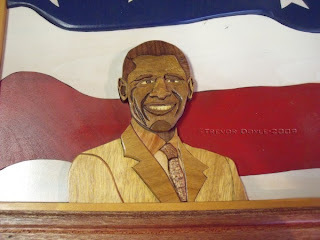 Since the new President of the United States of America, Mr. Barack Obama has took over office i am delighted for him and his family, So this inspired me to make this piece as a tribute to the president. I made this from several hardwoods and oiled some, painted some, glossed some, theres so much variety in there i find it hard to remember it all. It was all designed on computer first and then brought to wood. 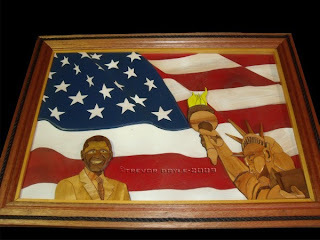 I taught it would be good to put the American flag in the background and also the Statue of Liberty in there also. So may the luck of the irish be with you Mr President Barack Obama and long may you stay. 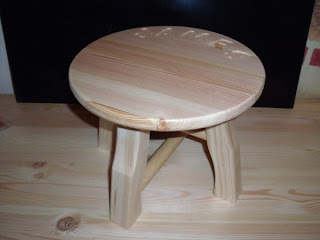 A miniture stool for my 4 year old Godson and Nephew! 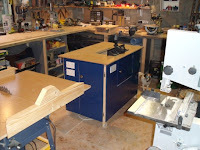 table saw, bandsaw and router mostly for the rough work. 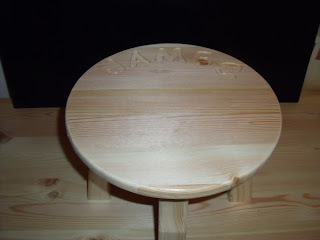 Then it is sanded down and finished by hand. 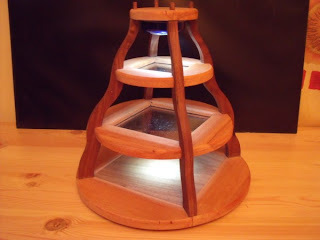 A Glass Shelf Ornament with a Downlight! 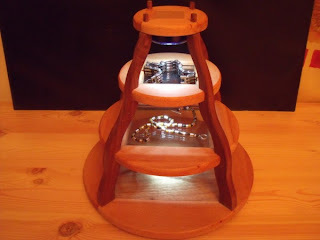 This is made from American Walnut, African Walnut, Beech and Glass. 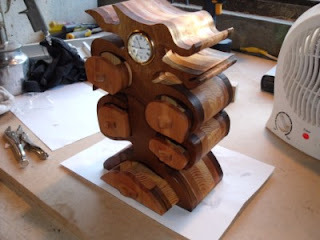 I finished this with teak oil. I made this using the bandsaw, Scroll saw, and Router mostly. 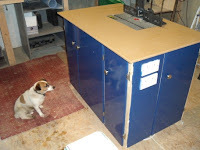 My Dog Lucky seems to like it anyway !! 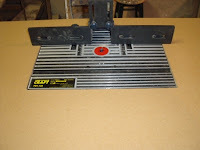 Google sketchup is great for designing woodwork projects. 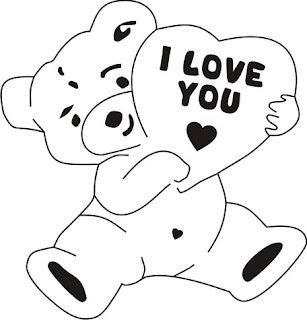 So i made up this teddy bear pattern for you to scroll. If anyone makes this please send me a picture of your finished project and i will put it up here on the blog for everyone to see. It could be cut just as a picture or maybe on top of a box face or something like that. Well i hope you like it. Hi all, This is my latest project I've been working on. Walnut, Pine and the handles are Mahogany. I made this jewelry box mainly from the scrollsaw and then finished it with Teak Oil. 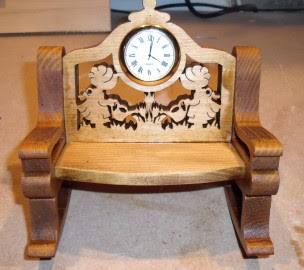 This one is a Rocking Chair Clock I made from pine and stained with dark oak. 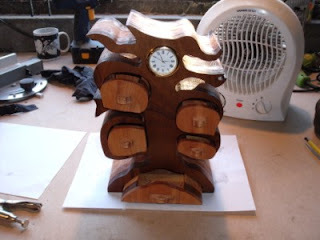 This is a design from Rick and Karen Longabaugh whom i got a book about scrollsaw miniature clocks. 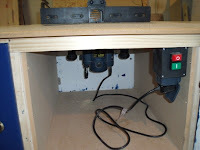 Welcome to my blog, I hope you find all the information on craftwork helpful, please keep checking back as i will be posting new projects as i make them, here you will find ideas, how to's, diy and more. Please leave comments or email me with any questions you may have. Email Tjdcrafts Here with any Questions or Comments you may have!